Our Annual General Meeting is taking place next Wednesday (October 17th) at 1pm in RHB 137. Due to ongoing issues, many emails sent to the branch have not been going through. Therefore I must request that all nominations for the exec committee should be re-sent to gucu-admin@gold.ac.uk, now that I know this email address is working. Apologies for any inconvenience caused by communication problems in the last few weeks. 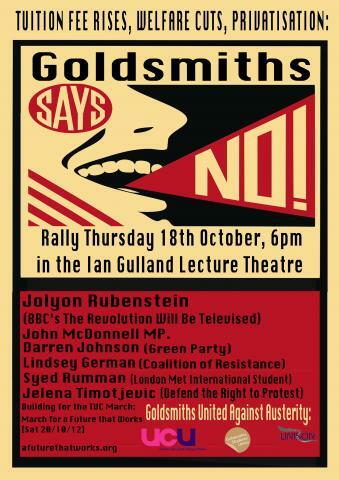 Hosted by Goldsmiths SU, UCU and Unison, this rally has an amazing line-up of speakers to help us build and organise for the TUC march next Saturday. The rally is open all – all members are encouraged to attend and to spread the word! Despite the amazing turnout at last year’s March for the Alternative – which drew 500,000 people – we know that the coalition government has still to implement 80 percent of its cuts programme. That’s why students and staff at Goldsmiths must unite against austerity. On the 20th of October we must demand A Future That Works, not a failing and dangerous campaign of austerity measures. Goldsmiths UCU members are asked to meet at 10am outside the college or 11am outside Waterloo station, to join the march and rally in Hyde Park on Saturday 20th October. The UCU Branch at Manchester Met is under attack. First, Christine Vie (assistant Branch Sec and NEC member till last year) was made compulsorily redundant. Time after time she was treated differently from the other 8 colleagues in the same position as her, and she remains the only compulsory redundancy out of a disbanded team of 9 academics and 9 admin staff. Now the Branch has received another attack as a second branch officer has been singled out. Professor Ian Parker has been summarily suspended from the University. Ian’s students have been tremendous and already have an online petition. This has now received over 1000 signatures from leading academics around the world, as it turns out that Ian Parker has an international academic profile. The UCU Branch is holding an emergency meeting tomorrow, which Ian’s students will also attend. Please send messages of support. Please sign the petition and circulate widely.